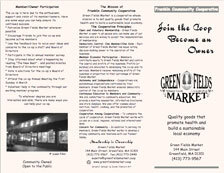 Diane Clancy and Susan Elkin created this brochure with Suzette Snow-Cobb to professionalize the marketing materials of Green Fields Market (Franklin Community Cooperative). They are systematically updating the various brochures that the Co-op is using. Susan Elkin has been taking different photographs for Green Fields Market - both for the brochures and also documenting farms from which the co-op buys. Suzette Snow-Cobb says, "Diane and Susan worked together, helping me to create visually pleasing, informational brochures. Their attention to the details, combined with creativity and clarity throughout the process, proved high quality results." Diane's specialty is working with you to clarify and express your own ideas and vision. 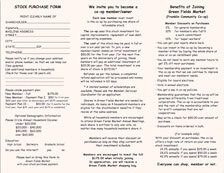 Give Diane Clancy a call to discuss your marketing needs at 413.773.7333.